Discussion in 'Tips and Tricks' started by Derf, Jan 24, 2018. I just thought I would share my previous weekends work to find a more permanent less disturbed home for my lighting elements. 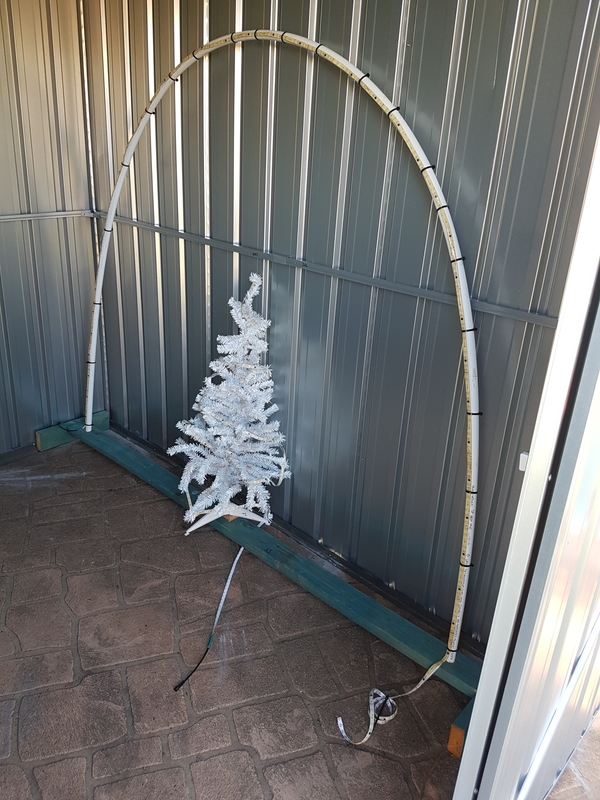 I purchased the cheapest shed from bunnings that would accommodate all my display elements with more room for the years of creating i'm prepared to do. I've anchored it to the pre-existing concrete slab so it doesn't blow away and the end result was quite a sturdy shed. I'm currently building shelves for the smaller items and using roof hooks to store the arches as they disassemble quite easily. (This might be the long weekends project) (Australia Day). Essentially I try keep everything relating to the show in this shed and nothing else (Expect for the blower as there is no room for it in the garage and back shed). so I can pull everything out and it is ready to go. 1. 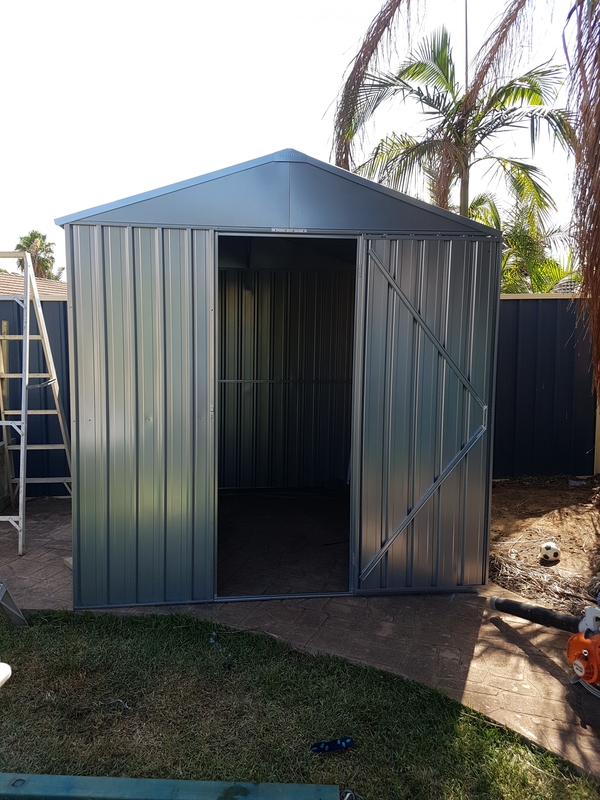 As it is a zinc coated shed it absorbs the heat quite a lot making it around 60-80*c inside. So I plan on cutting in a roof exhaust or an indoor to outdoor bathroom fan vent on the rear wall. 2. I would like to run underground power to the shed to either run the fan on a thermostat or just to have a GPO around that back end of the corner without having to run a 20-30m extension cord! Any suggestions / feedback is appreciated. I would also like to see how you guy's store your items for ideas on how to maximise storage. I actually used this to insulate a fish shed for my grandfather but found an exhaust fan do the same thing really. As Ralphy also stated with moisture that having a vent would be a lot better in the long run so I think I will opt for that Idea. If you can get foilboard at the right price then it would be a good start and costs nothing to run, being a tin shed, the tin heats up and then radiant heat will impact your stuff in the shed, the foil board will stop that radiant heat as it's a barrier. I would space it off the tin with some battens, say 20mm, to improve its performance as it's not touching the shed and there will be no heat conduction. A ventilator will help with humidity, but it will only lower the air temp to that of the ambient outside air and does nothing to prevent radiant heat from the walls which is where the heat comes from. I have a similar pitched roof garden shed. The pitched roof isn't designed very well, and during storms, rain blows up under the ridgecap, and into the shed. Once had a half a bucket full of water sitting under the ridge. That was extreme though - it was after cyclone Marcia. That brings up a good point. Probably best to lay down some surface spray before loading all your gear in. Geckos make a mess in my shed. The ones we have around here are not native to Australia and are a pest.